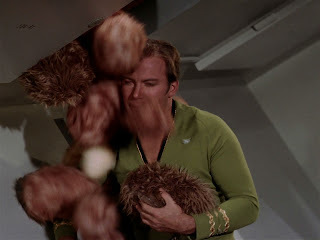 Star Trek: Asterisk "The Trouble With Tribbles"
Called upon to protect the development of Sherman's planet, the Enterprise encounters a rapidly reproducing species of cute fuzzballs. Kirk gets a headache. So, according to the peace treaty made with the Organians between Humans and Klingons, Sherman's Planet is supposed to go to the party that is most successful in developing it. So, the Federation's claim is being headed up on Deep Space Station K-7 and the Enterprise has been called in to help. Just a routine mission, right? And then K-7 calls in a Priority One distress call which could mean one of two things: Either they're under attack, or a tightly wound Federation official is abusing his power in order to get a platoon of guards to cover his storage compartments. They get to the station and meet the station manager, Lurry, Nilz Baris, the tightly wound Federation official who looks smug enough to slap, and his aid, Arnie Darvin. Baris is the Federation Undersecretary for Agriculture and, as such, believes he deserves the respect of the King of the Federation. THE KING! He demands that Kirk place all of his guards around the storage compartments filled with quadrotriticale, which is a high-yield grain that is the only Earth grain which will grow on Sherman's Planet. Clearly Baris thinks there will be trouble with the Klingons which Chekov says are "close enough to smell." Old Man Koloth smells like prune juice. While Kirk is busy being annoyed by Federation bureaucracy, the rest of the crew are invited to shore leave on K-7. So Uhura is hanging out in K-7's bar while a man named Cyrano Jones comes up to the bartender trying to sell him some wares. Among these rare galactic items is a tribble. The bartender is initially uninterested in the fuzzball until Uhura says she wants to buy it. Then the bartender picks up on the business opportunity and makes a deal with Cyrano. The bartender then tries to make a deal with Uhura, but Cyrano, miffed that he didn't get a good deal, gives the tribble to Uhura for free. SUDDENLY, KLINGONS! Captain Koloth, not the wrinkly old, ridgedy old man pictured above, but the younger version of the Klingon warrior who looks suspiciously like Trelane, shows up on K-7 to practice his shore leave rights under the Organian Peace Treaty. This, of course, gives Kirk no end of stress and annoyance, so he drops by for Bones to take care of his headache. 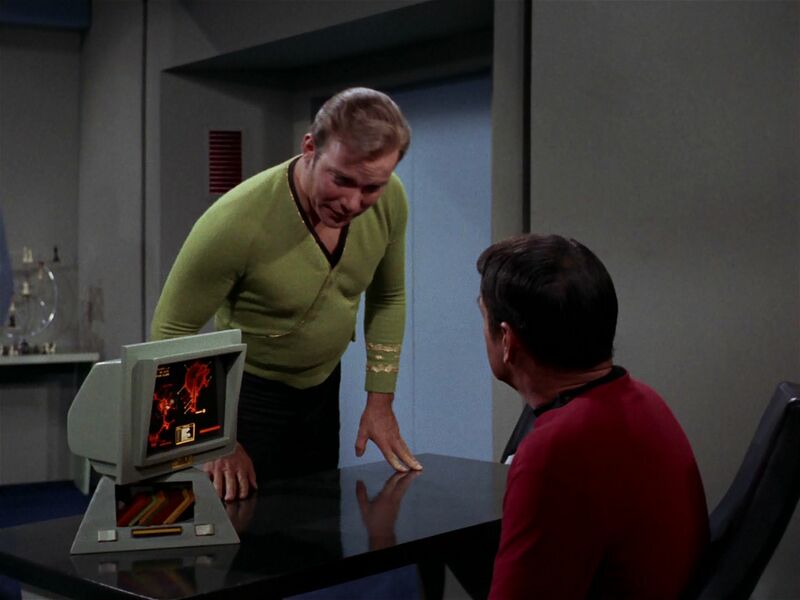 Meanwhile, he pretty much orders Scotty to stop reviewing technical logs and take shore leave. What Kirk doesn't understand at this point is that Scotty prefers reading his technical logs. "Are those the specs for a coffee mug?" Meanwhile, the tribble that Uhura brought back to the ship has multiplied. Bones says that as far as he can tell, tribbles are born pregnant. They only live to eat and reproduce. And they're getting everywhere. Back on the station, the crew is hanging out in the bar along with the Klingons and the Klingons start making fun of Kirk. Checkov wants to start a fight with the Klingons, but Scotty won't allow it. Tells him to sit down and sip his puny wodka drink while Scotty drinks his scotch. But then the Klingons compare the Enterprise to a garbage scow. And that's when Scotty throws the first punch. A bar fight and transport later, and Scotty and the crew are back on the Enterprise facing punishment from Kirk. When Scotty explains what went down in the bar, Kirk confines him to his quarters. Which is really what Scotty wanted all along. While Scotty catches up on his technical journals, Kirk deals with the fact that there is literally a tribble in every single room on the ship. He finds out that they're crawling through the air vents. Which poses a problem because there are air vents like that on K-7! TO THE STORAGE COMPARTMENTS! A minute late and a tribble short. Well, it would appear that a population of 1,771,561 tribbles (according to Spock's calculations) have gorged on the quadrotiticale. But the real problem? These tribbles are now dead. The poisoned grain killed them! Now they have a real problem, because now they have to find out who poisoned the grain, and they have a whole station full of suspicious Klingons. Kirk assembles all the important people in Lurry's office. 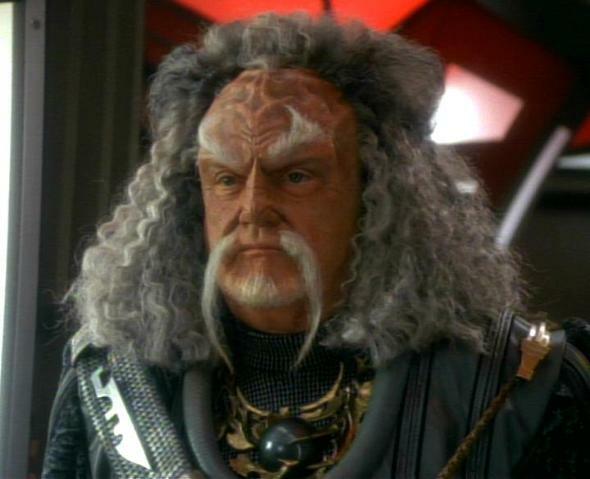 Koloth demands an apology, but Baris insists that would give the Klingon Empire the wedge they need to develop Sherman's planet first. As a compromise, Koloth asks that they at least remove the tribbles from the room. For whatever reason, tribbles and Klingons hate each other. But as the guards move the tribbles, they pass Darvin and go nuts. This reveals Darvin to be a genetically altered Klingon! He admits to poisoning the grain and the day is saved! Meanwhile, Cyrano Jones has to face punishment for the transport of dangerous animals. Kirk gives him a choice either spend the next 20 years in a penal colony, or spend the next 17 years (according to Spock's calculations) picking up every last tribble on the station. Without a transporter (apparently). Cyrano takes the 17 year deal and gets to work. Back aboard the Enterprise, Kirk is happy to find the ship swept clean of tribbles, and asks Spock, Bones and Scotty how they did it. They all deflect Kirk's questions until Scott reluctantly replies that before the Klingons went into warp, he beamed all of them into their engine room, "where they'll be no tribble at all." TRIBBLES! This magnificent episode, originally billed as a "Christmas episode," is one of the most iconic episodes in the the Star Trek canon. I give it a huge thumbs up for the way the plot and the sub plot eventually comes together perfectly and for the invention of the best space-kitty ever.